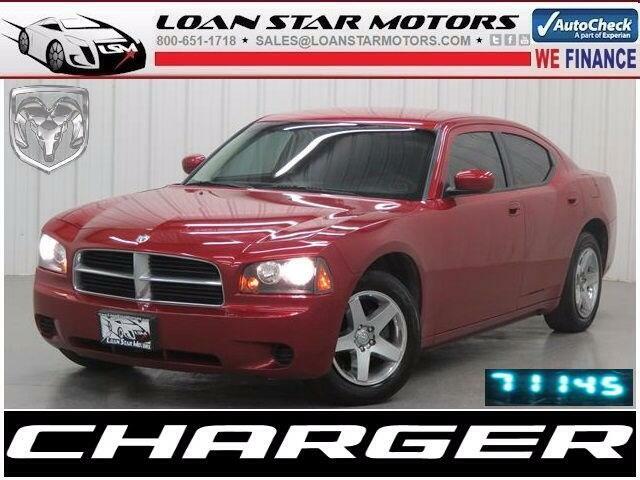 ***2010 Dodge Charger 4DR SEDAN 2.7L V6 NICE 71K MILES GAS SAVER***2010 Dodge Charger 4dr Sedan 2.7L V6 71k Miles Super Clean***100% AUTOCHECK GUARANTEED***WE FINANCE***WAC******Visit our website at www.loanstarmotors.com to view 60+ pictures of this vehicle ***WE FINANCE***AS LOW AS 3.99% APR FINANCING ON QUALIFIED VEHICLES W.A.C. ***Another fine pre-owned vehicle offered for sale by Loan Star Motors of North Houston Humble TX * Contact our Sales Department for Complete Details at any Time at Toll Free ***1-800-651-1718*** The Dodge Charger 4dr Sedan 2.7L V6 71k Miles Super Clean is well maintained and has just 71,145 miles. This low amount of miles makes this vehicle incomparable to the competition. There's no need to look any further. Loan Star Motors has the perfect match for you. This Dodge Charger's Torred on Dark Slate Gray color combination will make heads turn. Surprising quality accompanied by a high level of performance...this Torred on Dark Slate Gray Dodge Charger 4dr Sedan 2.7L V6 71k Miles Super Clean could end up being the perfect match for you. More information about the 2010 Dodge Charger: The 2010 Dodge Charger has hints of classic muscle car in its design yet is a rather roomy, practical and comfortable 4-door sedan. At the top of the line, the Charger R/T and especially the SRT8 bring serious high performance. With a 0-60 time of around five seconds, the SRT8 is the fastest sedan in the Dodge lineup. Most Chargers are rear-wheel drive; combined with a near-50/50 weight distribution it has more poise on curvy roads than the typical large sedan. All-wheel-drive sedans allow the Charger better all-weather composure. Strengths of this model include Distinctive, uniquely American style, comfortable ride, strong V8 performance, and supportive front seats ***WE OFFER NATIONWIDE FINANCING OPTIONS * COMPETITIVE RATES, DISCOUNTED SHIPPING AND WELCOME TRADES * Extended Warranty Programs/Low APR Financing Available WAC. Physical Address: 5547 FM 1960, Humble TX, 77338-Toll Free 1-800-651-1718 - Visit us on the web at http://www.loanstarmotors.com All advertised prices exclude government fees and taxes, any finance charges, any dealer document preparation charge, and any emission testing charge. The price for listed vehicles as equipped does not include charges such as: License, Title, Registration Fees, State or Local Taxes, Dealer Prep, Smog Fees, Credit Investigation, Optional Credit Insurance, Physical Damage of Liability Insurance, or Delivery Fees. DEALER makes no representations, expressed or implied, to any actual or prospective purchaser or owner of this vehicle as to the existence, ownership, accuracy, description or condition of the listed vehicle's equipment, accessories, price, specials or any warranties. Any and all differences must be addressed prior to the sale of this vehicle. Your actual mileage will vary depending on how you drive and maintain your vehicle.